The Advanced Condition Assessment and Pipe Failure Prediction Project has won the 2016 Australian Water Association award for “Best Research Innovation Project”. 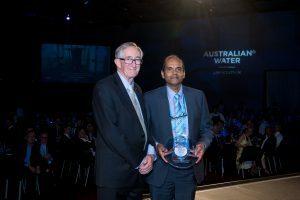 The award was presented to Dammika Vitanage of Sydney Water on behalf of the Project by AWA President Peter Moore at a Gala Dinner in the Melbourne Exhibition and Conference Centre on 11th May 2016. The photo shows Dammika holding the award trophy after receiving it from Peter Moore.